Unity’s lighting quirks and design of weapons/skills. | The bloggity. Ramblings of a game designer, programmer, musician, and overall nerd. Unity’s lighting quirks and design of weapons/skills. Hello all! I hope everyone had a productive, fantastic week. I actually went on a vacation to Lake Tahoe/San Francisco over this past weekend, so apologies for this post being a few days late. There will be another blog post regarding playtest results in the next day or two, so keep an eye out for that! However, lets get started on what THIS post is about: lighting and design changes. So I’ve struggling for a while as to why we weren’t getting any live lighting on our game. In the engine, it was working fine. However, when I pushed the build to our devices, only the lightmaps transferred (there was no live lighting, only static shadows from the environment). I found this issue fairly quickly, and it was a simple check box that either got overlooked or somehow unchecked. Everything EXCEPT the floor was marked as “Lightmap Static”. If an object isn’t marked as “Lightmap Static”, it won’t accept shadows from lightmaps or live lighting. The second issue, however, was more in-depth and took longer to solve: there were no shadows on the floor from the static environmental props. However, the first time I pushed the build onto my iPad, a noticed that, even though I put “Soft and Hard Shadows” on the quality settings, only hard shadows were visible, and they were super jagged. I did some research and changed Shadow Cascades from “Zero” to “Two”, and changed the Shadow Projection from “Stable” to “Close”, and the jaggedness went away immediately. However, I was still having an issue with only seeing Hard Shadows, and zero soft shadows. Now, theoretically, any options that overlap with each other should be condensed into one menu option. However, since they weren’t, I went through and made all the options the same for each light. I ASSUME that the quality settings is the lowest common denominator, as in all other settings filter through the Quality Settings (if something is a higher resolution than the quality, then it’ll be knocked down to what the quality says). It appears that’s not the case, though. I’m unsure what exactly happens in the black box behind Unity for lighting. Not only was this tucked away into a small corner page (not shadows, not lights, not directional lights, but directional lighting shadow details), but why give us an option if we’re not allowed to use it? 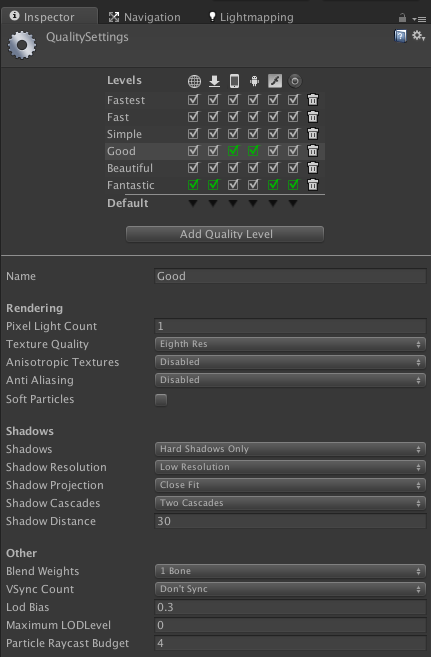 The quality settings for Mobile were marked as “Hard and Soft Shadows”, but soft weren’t showing up because mobile doesn’t support soft shadows. The other side of this post is about design, so let’s discuss that really quickly. As I mentioned previously, we are moving our weapon designs from “give 3 unique skills” to “give 2 unique skills + each unit has a base skill they keep regardless of weapon choice”. I’m calling this the 2+1 skill system. There were a few reasons behind the change. One was so that each unit could keep a skill that represents their role in the game, and with that, we can have weapons give added bonuses, effects, or skills that only trigger when the base skill activates. This allows for a lot of interesting multi-layered mechanics. Also, this allows me to avoid the possibility of a class accidentally falling out of it’s intended role. In addition, this allows us to trim off 4 new icons that we would have otherwise needed, and since the art team is currently well overloaded, I’m sure Keren appreciates that! With this, I’ve devised a simple framework for me to follow for our new weapons. For example, the Knuckleduster will have a tank weapon and a DPS weapon. The Prospector will have a healer staff and a mage/DPS staff, and so on. This quarter is quickly coming to an end, and our beta build is going to be fantastic! I’m incredibly excited about it. Again, expect a short post about playtest results soon. Hope you all have a fantastic Sunday and a great week.